Genoa (Genova in Italian), or ‘La Superba’ as the local Genoese call their beautiful city, is a vibrant town built on several hills leading up steeply from the port, which is the largest in Italy. There is a zest for life here, with the Old Town a maze of medieval streets and plazas, and many of the buildings in the Via Balbi and Via Garibaldi among the finest in Italy. It was also the home port of the iconic Italia Line fleet of famous express liners as well as that of the famous Ansaldo Sestri shipyard, four miles west of the port and today part of the Fincantieri Group. The beautiful and fast pre-war ‘Blue Riband’ holder Rex and running mate of Conte di Savoia lay in utter ruins and submerged on their sides in coastal Italian waters in the Adriatic, and it was clear that the rebuilding of the Italia Line fleet would be many years away as the Italian economy lay in complete ruination. Indeed, it was the Monfalcone yard of Cantieri Riuniti dell’ Adriatico that got back into production first, producing two handsome liners for the Genoa to South America trade of Italia Line as Guilio Cesare and Augustus of 27,078 grt in October 1951 and March 1952 respectively. The Andrea Doria in dock at Genoa. Two prestigious, new and fast Transatlantic express liners were needed to restart the Genoa to New York passenger trade of Italia Line. However, it was clear that the new ships would be smaller than the Rex and Conte di Savoia while Italy recovered her economy, but would be more stylish, comfortable and luxurious. The Ansaldo Sestri yard at Genoa had produced the brilliant ‘Blue Riband’ liner Rex in 1932, and it was to this famous yard that two orders were given in December 1949. 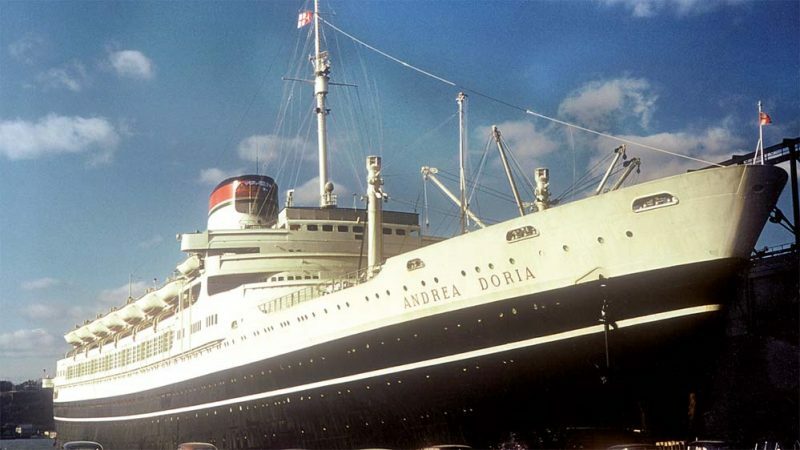 Andrea Doria, to be followed by her sister Cristoforo Colombo, were to have hulls of length 702.0 feet, moulded beam of 90.2 feet, and depth of 30.25 feet, with a gross tonnage to work out at around 29,100. They were to be twin screw fast express liners powered by six Parsons geared turbines, the high pressure turbine being double reduction geared, and the intermediate and low pressure turbines being single reduction geared. A service speed of 24 knots was required from their normal shaft horse power of 50,000 shp, with Andrea Doria easily exceeding this on trials at an average speed of 26.44 knots at 62,500 shp. Their hulls were subdivided by twelve bulkheads into eleven watertight compartments, and constructed so that they would remain afloat if any two were breached, giving a list of no more than fifteen degrees. Unfortunately, the collision on the starboard side near her bridge that sank the Andrea Doria on 25th July 1956 penetrated more than two watertight compartments, and this good watertight subdivision only served to keep her afloat for eleven hours. The latest bridge equipment included two radars, gyrocompass and other navigation equipment being fitted, along with fire control systems and fourteen lifeboats and two motor launches, all could be launched if the liner had a list of up to twenty degrees. The three classes each had their own separate Main Lounge, Dining Room, and swimming pool with verandah bar. On Promenade Deck, First Class and Cabin Class also had the added feature of a separate ballroom, with First Class having an additional Cocktail Bar and Observation Lounge. The Main Lounges of First Class and Cabin Class on Promenade Deck were designed by Gio Ponti and Nino Zoncada, with the walls of the First Class Lounge transformed into works of art and a mural painting entitled ‘The Legend of Italy’ by Salvatore Fiume, which covered almost entirely the fore and aft walls of the room. This was a bright painting which gave a sense of uplift in spirit to the room, and acted as a backdrop to a large bronze statue by Giovanni Paganin on the aft wall of Admiral Andrea Doria, a medieval Italian Admiral, for whom the ship was named. This Main Lounge at the forward end of the deck was surrounded by the Winter Garden with large ceramic panels by Guido Gambone. The Ballroom adjacent to the First Class Lounge had another large mural entitled ‘The Feast of Neptune’ by Piero Zuffi. The First Class Entrance Hall was wide and panelled in light coloured wooden panels as were their adjacent shops and Purser’s Office.